Imagine: you walk into your room, sit in front of your computer, and it unlocks itself. You finish what you’re doing, walk away, and it locks itself. No, it’s not magic – it’s Bluetooth and it’s easy to set up! Essentially, you’ll have to pair your device with your computer so that the computer can recognize its MAC address, and allow both the computer and your phone to be “discoverable.” Then, the respective software for each operating system should take over from there, locking the computer. Each method should use the OS’s default locking mechanism, no fake proprietary garbage here. Additionally, you should be able to use any kind of device that will connect via Bluetooth. 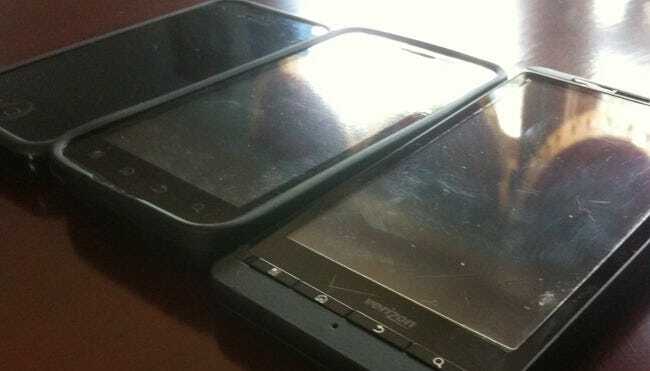 I’ve only used smartphones – an iPhone 4 and a Droid X – so I know they work for sure, but there are various reports online of success on OS X and Linux with Wii remotes and other devices. The Windows software, BTProximity, only works with the Microsoft and WIDCOMM Bluetooth stacks. On OS X, you need to have Proximity installed and configured to get this trick to work, but the actually execution is done by AppleScripts that you can find on the internet. If you don’t mind paying some money, Rohos Logon Key can use Bluetooth as well as USB drives to accomplish the same task, though it’s a little steep at $32 for a personal license. They also have an OS X version. The Linux software BlueProximity seems to offer the best package. You can tweak your settings a little bit better and it has support for distance approximation, too. We’ll be doing a step-by-step guide for Windows, but it shouldn’t be too hard to figure this out on OS X or Linux. The same basic steps should apply. Make sure you Bluetooth stack is running and your device is paired properly. 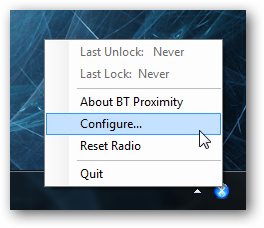 After you download and install BTProximity, it should be running automatically. If not, find it in the Start menu. You’ll see the main window pop up. 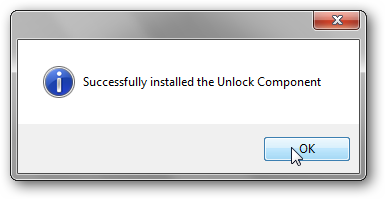 The first thing you should do is click the “Install Unlock” button. 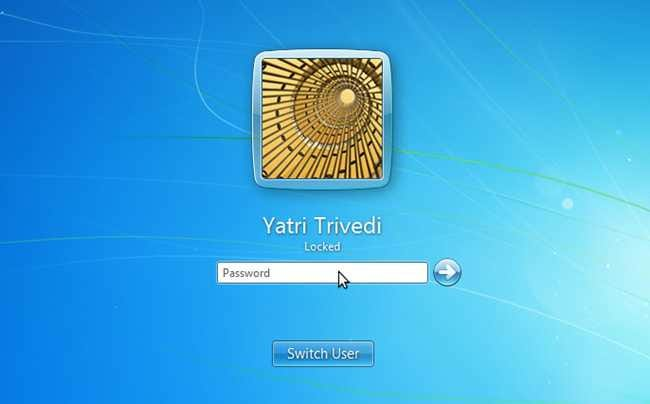 Not doing this will still allow your computer to lock itself when you leave, but it won’t unlock when you get back automatically. You’ll see a little pop-up message when it installs successfully. Click OK and then click the “Manage Credentials” link in the Configuration window. 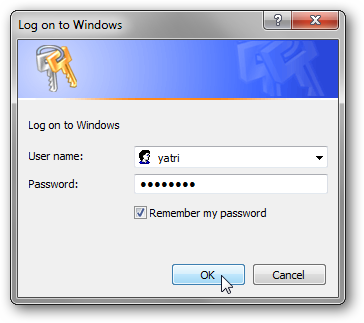 You can type in your username and password, and select whether or not to remember it. Since I’m using this at home, I’m not too worried about security, so I checked that option. Click OK.
To choose your device, click on the “Select…” button in the Configuration window. My computer’s Bluetooth device had some problems finding things this way, so I manually typed in the MAC address of my phone in the field. This worked for me without any problems. You can change the polling time from the default of 90 seconds. If you decrease this too much, your battery may not last as long, so remember that. 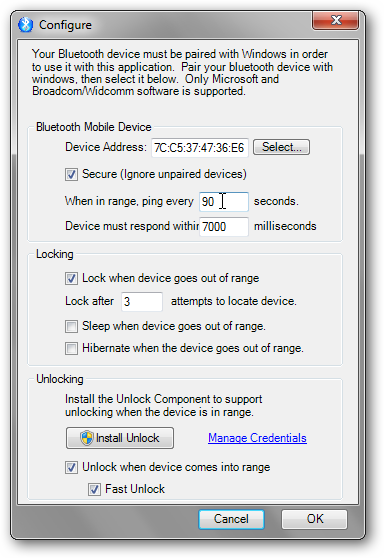 Be sure to check the “Lock when device goes out of range” box, and adjust the number of attempts accordingly. Devices that cut out sometimes may need a higher amount of connection attempts before the computer locks. Next, check “Unlock when device comes into range”. The “Fask Unlock” option will allow your computer to unlock as soon as the MAC address of your phone is seen. That’s it! Keep in mind that Bluetooth distances can vary depending on your surroundings. As such, it works very well for me at home – when I leave the room the computer locks, and when I enter again it unlocks. If you’re having issues, you may want to uncheck “Secure (Ignore unpaired devices)” in the Configuration window. This a pretty simple setup that works pretty well for home use. I can automatically unlock my computer when I’m in any given room so long as I have my device’s Bluetooth connection on. Do you have a better way to log in? Have you thought of a better use for a simple trick like this? Share your thoughts in the comments!